The Career home for the Athlete, your Sim will work between the hours of 8:00 AM and 12:00 PM. The Soccer Ball is the tool you can obtain from The Hobby Shop to train this skill at home. 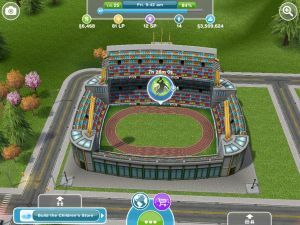 Q. I am on the driver request thing and it said i have to build the stadium an i did but it wont let me pass the request? A. Not sure where you are at with this - the Driver quest line is not part of the Stadium quest line as far as we know. Can you restate your question with more information please? Well it should add to the job level - not sure since we did not do that. Why not try it and tell us? So what happens if you train with the ball before you build the arena?